Most of us learned the sweet little poem, Roses are Red, Violets are Blue … as children and take it for granted that roses are red and violets are blue. For people with color blindness, the red rose could look dull or even black, and the blue violets might blend in with the green leaves. 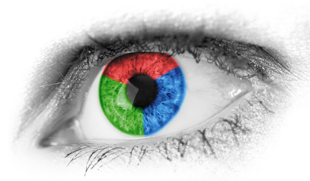 Color blindness or color vision deficiency is far more common in men than women. The most prevalent form (red-green) impacts 1 in 12 men (8%) versus 1 in 200 women (less than 1%) of Northern European ancestry. In fact, Facebook founder Mark Zuckerberg has the most common form of color blindness, but sees blue as crystal clear as the shade he chose for Facebook. The incidence of color blindness is much lower in other populations. Take A Color Blindness Test HERE. How Do Humans See Color? In the human eye, photoreceptors in the retina are shaped like rods and cones. Each retina contains about 120 million rods compared to only 6 million cones. Both rods and cones contain photopigment molecules that undergo a chemical change when they absorb light. This chemical change triggers electrical signals passed from the retina to the visual parts of the brain. While rods contain only one photopigment, cones contain three different photopigments. Cones respond to long (red), medium (green), or short (blue) wavelengths of light, providing humans with rich color vision. The center of the macula (fovea) is responsible for the most acute color vision because it contains the highest concentration of cones. Take A Color Blindness Test HERE. The two most common forms of color blindness disrupt color perception, but do not impact visual acuity (sharpness of vision). Other types are accompanied by additional vision problems and are typically classified as complete color blindness. Red-green color blindness: This is the most common form, resulting in problems distinguishing between some shades of red, yellow, and green. There are four subtypes within this spectrum, each of which causes different color deficiencies. Protanomaly: Red, orange, and yellow appear greener and colors are not as bright. Protanopia: There are no working red cone cells, resulting in red appearing as black. Certain shades of orange, yellow, and green all look yellow. Deuteranomaly: This is the most common form and is linked to an abnormal green cone photopigment. Yellow and green appear redder and it is difficult to discern violet from blue. Deuteranopia: There are no working green cone cells, so reds look brownish-yellow and greens appear beige. Blue-yellow color blindness (also called tritan defects): This rare form causes problems differentiating shades of blue and green and distinguishing dark blue from black. Males and females are affected equally, but the condition impacts fewer than one in 10,000 people worldwide. There are two subtypes. Tritanomaly: Limited blue cone cells result in blue appearing greener and it can also be difficult to distinguish yellow and red from pink. Tritanopia: Often called blue-yellow color blindness, this results from a lack of blue cone cells. Blue looks green and yellow appears violet or light grey. Cone monochromacy: Two of the three cone cell photopigments don’t work, resulting in red cone monochromacy, green cone monochromacy, or blue cone monochromacy. When only one type of cone works, the brain cannot make the necessary comparisons to distinguish between colors. Blue cone monochromacy: This more severe form of color vision deficiency is associated with very poor visual acuity and severely reduced color vision. Affected individuals have additional vision problems including increased sensitivity to light (photophobia), involuntary back-and-forth eye movements (nystagmus), and nearsightedness (myopia). This rare type affects more males than females and only one in 100,000 people worldwide. Achromatopsia: This inherited visual disorder is present at birth and results in decreased vision, light sensitivity, and the absence of color vision. In the U.S., it affects about 1 in every 33,000 people. There is currently no cure for color blindness. Many people learn to compensate, although it can be more of an issue for artists and others who rely on color. Several apps for smartphones are available, but most are not designed for real-time applications and functionality. Wearable augmented reality devices (e.g. Google Glass), have paved the way for wearable systems to help people with color vision deficiency. Several companies have developed color blind glasses, which are commercially available. These glasses can help professionals pass the Ishihara Color Vision Test. They also reduce academic and work-related challenges associated with colorblindness and improve the enjoyment of everyday activities – from playing sports and watching television – to visiting art museums. Enchroma glasses, which start at $349 retail, utilize a special optical technology called multi-notch filtering. This establishes a more accurate ratio of light entering the eye’s photopigments so people with colorblindness can experience a more normal spectral response. For children and teenagers born with color blindness, seeing vibrant colors for the first time leaves them teary-eyed, ecstatic or speechless. Of course they also help adults, most of whom have come to rely on other compensatory measures to deal with this problem. Take A Color Blindness Test HERE. How Stable is Your Eyeglass Prescription?